meori is more than a foldable storage box—it’s got the convenience of shopping bags with a sturdy design that folds flat for storage and unfolds in a snap. 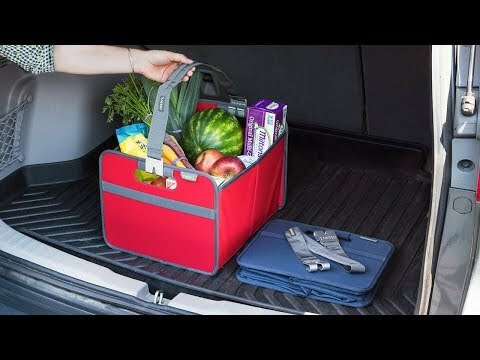 Carry or organize up to 65 pounds of groceries, sports equipment, trunk contents or just about anything else. The polished finish is attractive enough for at-home storage and the Earth-friendly design (partly made from recycled materials) wipes clean for easy care. Dimensions: Flat: 12.75" x 10.75" x 2"; Open: 19.75" x 12.75" x 10.75"
So versatile, as advertised! Easy to clean, fold,sturdy but light weight at the same time. Will most certainly order more! 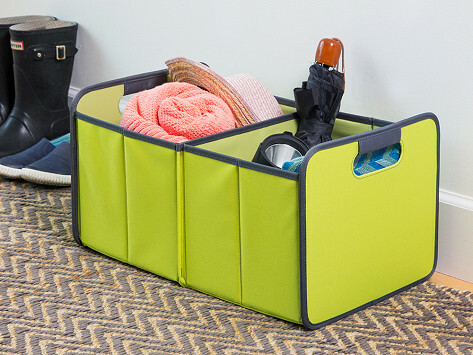 meori is more than a foldable storage box—it’s got the convenience of shopping bags with a sturdy design that folds flat for storage and unfolds in a snap. Carry or organize up to 65 pounds of groceries, sports equipment, trunk contents, or just about anything else. Besides being built to last, the outside is attractive enough to be seen. So you can use them as at-home storage. Made from recycled and recyclable materials (Earth says thanks) and tear-proof, wipe-clean polyester, they’re easy to care for, too. There are two roomy sizes to fit your your stuff. The medium-sized box is great for comfortable shopping, with removable padded carrying straps. Whether you’re toting or storing, or doing a bit of both, these smart boxes make the job more convenient, and good-looking, too.